Acronis Backup saves backup data in the proprietary tib format using compression. This reduces the amount of needed storage space. A backup is a single unit of "saved data", which is stored in an archive. An archive is usually in the BackupName_Year_Month_Day_HH_MM_SS_.TIB format. (!) By default the archive name is always in the format above. This is designed this way so that backups can be stored in archives. For exceptions see Acronis Backup & Recovery 10: Simplified Archive Naming. A full backup is a full copy of the data. The size of a full backup may be smaller than the original. This can be adjusted by the compression level in the backup options. An incremental backup only contains the changes from the previous backup. The previous backup may be a full, incremental or a differential backup. Incremental backups allow you to form long chains of backups to save space. A differential backup contains only the changes from the previous full backup. The base backup is always a full backup. Differential backups are useful if you would like to avoid using long backup chains and would still like to save space. See also Difference between Full, Incremental and Differential Backup. An archive is a "container", which holds one or multiple backups. An archive is identified by the name set in the backup plan/policy. Backups saved to personal backup locations or centralized unmanaged vaults are stored in the folder that you specify. The information about the archives is located in the .meta folder, which is in the same folder as your archives. These archives can be accessed at all times, even if the Acronis Storage Node is not running. Archives stored in centralized managed vaults are managed by the Acronis Storage Node. The recommended way to store, restore or manage those archives is to do so via the Acronis Management Console and the Acronis Storage Node. However, see also Acronis Backup & Recovery 10: Manually Exporting an Archive from Centralized Managed Vault. Please note, if the Acronis Storage Node is not running, then those archives are not going to be accessible. 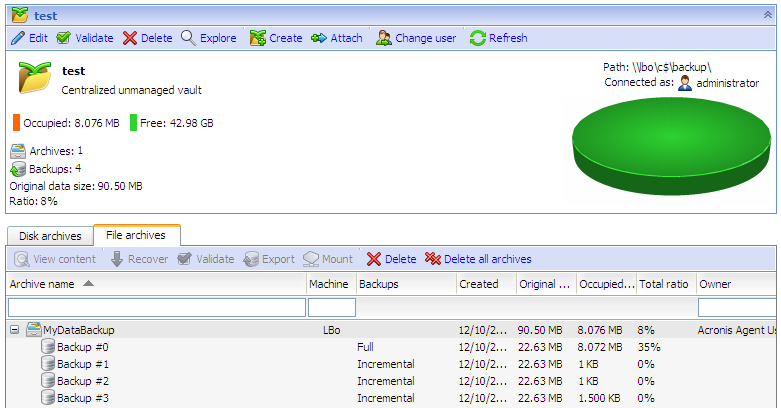 Hence, when backing up the server with the Acronis Storage Node, please save the archives to an unmanaged vaults. You should never attempt to access your archives without using Acronis Backup & Recovery. To restore an archive from a centralized managed vault, you have to connect to an Acronis Storage Node. A vault is a storage place where you can keep one or several archives. Please see Acronis Backup & Recovery 10 Vaults for details. To continue a backup sequence, create a backup plan with the same archive name as the original (with the original backup destination). If you would like to be able to keep only one backup inside the archive, then please see Setting up a backup plan to store only one backup. If you must have the name of the backup to be predefined, i.e "Mybackup.tib", for batch file purposes, then as an alternative you may create the backup from the Acronis command line utility. Please see the command line reference or the user guide for details.